Monmouth County is a part of Central New Jersey and is within the metropolitan area of New York. It’s famous for its several tourist destinations, including Asbury Park, Sandy Hook, and Long Branch. Whenever you are here, you will never run out of activities to do and sights to behold. It is also famous for its wineries and breweries, which are all over the region. If you live here or you own a business, you surely don’t want your place to look like wine got spilled on the floor. You want your tiled floors and walls to look immaculate. The Grout Medic can fulfill that request as easy as 1-2-3. Monmouth County enjoys a humid subtropical climate, meaning there are hot summers and mild winters in this area. Homeowners and workers find the weather comfortable even during the summer season. It’s a family-friendly county and has plenty of important roads passing through it, so people have no problem commuting to work. Monmouth County is a place for everyone – whether you are seeking for a job, you are a college student or a married couple with or without kids. Just like with other areas, the homes and office buildings can get untidy. Sometimes, people are just tired of their day-to-day activities, and they want to rest. It causes them to neglect cleaning activities. If you have no time to devote to keeping your tiled floors and walls clean, we are here to do that job for you. The Grout Medic is the one to turn to whenever you have a problem with your grout and tile. The Grout Medic provides grout cleaning services to homes and professional organizations in Monmouth County. Our customers in this region love the results we give to them after we finish our work. We know that we have many competitors in this area, which is why we do our absolute best, so our customers keep coming back. They also recommend us to their friends and loved ones. The difference between the Grout Medic and other grout and tile cleaning service providers in Monmouth County is that we comprehend what the locals are going through. We know what they need and what their desires are because our grout and tile experts live in this region as well. We all have a complete understanding as to what our customers worry about, and therefore we provide the solution. Kitchens and living rooms will become spotless because of our safe-to-use products. Plus, we only implement green techniques, so we don’t harm the environment. If you want a company that will take care of your grout and tile cleaning requirements, you should trust our local experts. The Grout Medic will treat your home or office as if it is our very own. We perform our jobs well so we can meet or even surpass the expectations of our customers in Monmouth County, New Jersey. The Grout Medic of Monmouth County and Middlesex County New Jersey specializes in grout cleaning and is proud of offer grout cleaning services, using proprietary products and environmentally friendly vapor technology. The Grout Medic deep-cleans grout with high heat, low pressure to remove dirt and grime, leaving it disinfected, fresh and renewed. The Grout Medic’s grout cleaning services are done with green steam grout cleaning technology to provide a chemical-free process. Our grout cleaning services provide a safe alternative to chemical cleaners most homeowners use daily. Hard scrubbing with the wrong tools and harsh chemicals can cause damage to your grout and tile, but unaddressed maintenance can create long term issues. Both overworking and ignoring your grout can lead to costly repairs and grout replacement. The Grout Medic’s top-of-the-line vapor technology offers thorough grout cleaning with no damage. Rid your grout of the mold, dirt and grime that’s been embedded for years! Don’t let the look of your tile surface be ruined by discolored and dirty grout. By scheduling a grout cleaning appointment with The Grout Medic of Monmouth County and Middlesex County, you can make sure your grout stays clean and in great shape for years to come! Call the The Grout Medic of Monmouth County and Middlesex County, New Jersey today at 732-706-0500 in Monmouth County or 908-231-0110 in Middlesex County or fill out our quick Customer Info Form to get started right away! The best way to preserve the quality and appearance of your grout is through grout sealing services from The Grout Medic of Monmouth and Middlesex County. We will apply our proprietary clear grout sealing material carefully to each line of grout. This sealant is designed to protect the porous grout from absorbing any dirt, preventing discoloration and mostly to protect, beautify your tile floors and walls for years to come. The Grout Medic of Monmouth County and Middlesex County recommends grout sealing after every grout cleaning to ensure a long-lasting solution to grout discoloration every 2 years. Without grout sealing, you open the door for dirt, dust, and grime to enter back into the pores of the grout. At The Grout Medic of Monmouth County and Middlesex County, we are specialists in clear grout sealing. Get grout sealing services from The Grout Medic of Monmouth County and Middlesex County, NJ. Call us at 732-706-0500 in Monmouth County or 908-231-0110 in Middlesex County or fill out our quick Customer Info Form today! Color Sealing your grout helps to protect it and keep it looking great. 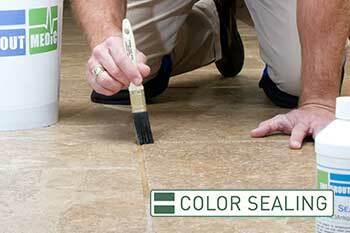 The Grout Medic of Monmouth County and Middlesex County is proud to offer color sealing services for homeowners and business owners who want to improve the look of their home while also maintaining the integrity of their grout. By applying a color sealant or grout stain to the grout lines, The Grout Medic of Monmouth County and Middlesex County prevents the contamination of your grout from all the things that come in contact with it. Grout color sealing provides a watertight barrier for your grout, so you can worry less and have beautiful grout lines. The Grout Medic of Monmouth County and Middlesex County would love to help advise you on the right tone choices for your grout color sealing job. The Grout Medic of Monmouth County and Middlesex County, NJ can clean and seal your grout right away, if you call us at 732-706-0500 in Monmouth County or 908-231-0110 in Middlesex County or fill out our quick Customer Info Form! Discoloration also happens over time. When grout is left unsealed, it collects dirt, dust, grime, mold, and more materials in its microscopic pores. Even a simple spill on the floor can stain the grout for the long-term. The Grout Medic can clean most grout to like-new condition using our vapor technology, sometimes grout is stained so badly that there’s just no saving it and requires it to be regrouted. If your grout has become missing, discolored, or damaged, it’s time to have it removed and replaced by the experts at The Grout Medic of Monmouth County and Middlesex County. With regrouting services, or grout repair your tiled surface can look brand new again, without the hassle and costly expense of retiling. Not only will the floor or wall surface look refreshed, but you also extend the life of your tiled area by protecting it with new grout. A concrete-like substance, it provides a barrier and creates a watertight seal, ensuring that moisture and dirt doesn’t seep underneath the tiles, loosening their bond from the wall or floor. 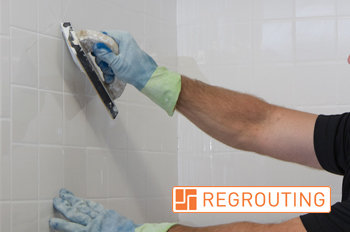 Regrouting services also provide health benefits, by getting rid of mold, dirt and mildew that’s built up over time. Instead of wasting time and money trying to re-tile the entire surface, regrouting services dramatically improve the appearance, almost as if you had replaced the tile altogether. Let the specialists at The Grout Medic of Monmouth and Middlesex County remove and replace your grout. Call The Grout Medic of Monmouth County and Middlesex County, NJ today at 732-706-0500 in Monmouth County or 908-231-0110 in Middlesex County or fill out our quick Customer Info Form to get help right away! When old or poorly installed caulk begins to crack and peel, the result is an unsightly area that quickly begins to collect mold, mildew, mineral deposits and can leak water into your floors or walls and cause major damage. With tub recaulking and shower recaulking services from The Grout Medic of Monmouth County and Middlesex County, you can get a fresh, clean look and the assurance that caulk has been expertly installed. This service protects your tub, sink, tile and countertops from grime buildup and damage. Recaulking is one of the simplest things you can do to update the look of your home while keeping your caulked surfaces in great shape. Caulk is the white, cream or gray-colored and many other shades placed at the corner seams of a tiled surface or where a tub meets a shower walls, a kitchen countertop meets a wall, and any other place that requires a watertight seal. This is applied and smoothed within a seam or joint to ensure the two pieces meet evenly and look attractive, and that no moisture can seep through. With recaulking services from The Grout Medic of Monmouth County and Middlesex County, you get a clean, fresh seal and protection from future damage, mold, and fungus growth. Mold can be dangerous to your health, so it is important to protect all areas of your home against this dangerous substance that collects around old caulk. If see black spots or cracks along the caulk in your kitchen, bathroom or anywhere in your home, call The Grout Medic of Monmouth and Middlesex County, New Jersey. Recaulking not only protects your tile and fixtures, it will improve the dirty look of your home. Recaulking is simple and quick! Call us today at 732-706-0500 in Monmouth County or 908-231-0110 in Middlesex County or fill out our quick Customer Info Form. Tiled surfaces that are cracked, broken or chipped are an eyesore to the look of your bathroom, kitchen, and other rooms. What’s worse, cracked tiles allow moisture to seep beneath the surface, allowing dirt, mold, and mildew to build up and spread underneath adjacent tiles. This can cause an unpleasant environment that could even turn dangerous for the health of you and your family! There’s a good chance you don’t need to completely retile to fix the problem of damage, loose or missing tiles if you have tiles or can find replacement tiles. The Grout Medic of Monmouth County and Middlesex County performs tile repair services. Our technicians can visit your home to recommend whether you’re a candidate for a simple tile repair or tile replacement which costs thousands less than a full makeover saving you money. It’s smart to have the tiles replaced or reset. even the smallest cracks or chips in your tile could lead to a more severe problem in the future. The talented technicians at The Grout Medic will visit your home to evaluate your tile damage and recommend repairs. Whether you need tile repair or replacement, or grout repair or replacement due to tile damage, The Grout Medic of Monmouth County and Middlesex County can ensure a nearly flawless, attractive result. You deserve to have beautiful tile within your home, and there’s no reason to wait! We can repair your tiles quickly and affordably. Call us at 732-706-0500 in Monmouth County or 908-231-0110 in Middlesex County or fill out our quick Customer Info Form today! Find out how affordable tile repair can greatly improve the look of your home without spending a lot of money for a kitchen or bathroom make over. If you’re worried that loose, hollow, or missing tiles mean you must completely re-tile your floor or backsplash, take a step back and call The Grout Medic of Monmouth County and Middlesex County. Our skilled grout and tile technicians can replace individual tiles or entire sections, saving you the time and expense associated with a complete tile remodeling job which costs thousands of dollars. To ensure high quality results, tile removal and replacement should be performed by a professional. Our technicians will visit your home to assess the damaged surface, determine the best course of action to take and give you a written estimate, for free. We will replace cracked or chipped tiles, and place new tiles in bare spots, leaving you with a clean, elegant-looking surface. We will also make any necessary grout repairs to be sure that your tile surfaces are secure and stable for years to come. 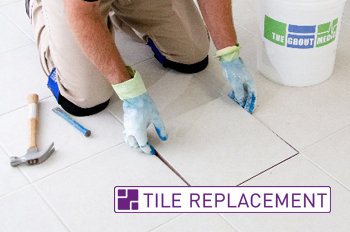 Tile replacement services also extend the lifespan of your floor and can serve to reduce future costly repairs. We can make your tiled surfaces look like new again at a fraction of the cost of a complete makeover. Don’t put off tile replacement services so long that you’re forced to completely re-tile an area of your home. Call The Grout Medic of Monmouth County and Middlesex County for a free estimate. Get a free quote on tile replacement services from The Grout Medic of Monmouth County and Middlesex County, NJ by calling us at 732-706-0500 in Monmouth County or 908-231-0110 in Middlesex County or filling out our quick Customer Info Form! Tiled surfaces on tub and shower walls that have missing grout, cracked grout, or simple things like caulking along corner seams cracked or missing lead to water penetration behind the tile surfaces causing the wallboard behind the tile to get wet and damaged. The Grout Medic of Monmouth County and Middlesex County, technicians can provide water damage repair for your shower or tub walls in your bathroom. When water damage repairs are not addressed, the unattended areas may develop mold and mildew, causing a health risk for your family. Also, water damage causes other issues in the home like water spots on ceilings below and can most likely cause mold. Most people shouldn’t wait to have these areas fixed. The caring technicians at The Grout Medic of Monmouth County and Middlesex County will schedule a visit to your home as quickly as possible to assess the damage, give you a written estimate and begin work right away. • The Grout Medic of Monmouth County and Middlesex County removes water-damaged areas in showers of the home. • The Grout Medic of Monmouth County and Middlesex County can refinish the area to your specifications. Water damage in showers cannot wait! For the protection of your family and your home, have water damaged repaired immediately by The Grout Medic of Monmouth County and Middlesex County New Jersey. Call us at 732-706-0500 in Monmouth County or 908-231-0110 in Middlesex County or fill out our quick Customer Info Form! The Grout Medic serves Monmouth County, including the areas of Allenhurst, Adelphia, Allentown, Cliffwood, and Farmingdale. Give us a call today or fill out the form on our website to see how we can help you. There are many benefits of contracting The Grout Medic for all your tile and grout cleaning needs in Monmouth County, NJ. Whether you’re looking into buying, selling, or just trying spruce up your property, we can help you to make your tile and grout shine as it did the day it was first put in. Excellent service. John cleaned and recolored my grout on my floor tiles and they look great. He also cleaned the grout on my ceramic countertop tiles. He is very professional. It went very well he arrived for my estimate on time, called me later with a quote and I decided to have him do it. We used The Grout Medic to re-grout the floor of our shower, which had been leaking. She did a very good job and we would definitely recommend her. We would use her again. I had shifting of my home which caused the ceramic tile to crack in my bathroom. They replaced the broken tile and overgrouted. They were wonderful! They were clean and wanted to make sure I was happy. I was very satisfied with the results. They were quick to get us scheduled. Fixed crumbling grout in shower stall, replaced slate tile on porch, fixed numerous grout areas in travertine tile in shower/floors. This company did a superior job. After using several other companies with marginal results, I was thrilled to find Jesse and Nancy. The workmanship is top notch at a very reasonable price. Remove old and moldy grout from the master bath shower. Re-grouted and sealed. Someone arrived to give a quote at the stated time. They also arrived timely for the job. The individual completed the work in a timely manner and cleaned up after himself. The finished results were very good. I would recommend this company. Cleaned and stripped sealer off my counter top tile due to wrong sealer being applied, re stained all gout tiles. Have approx 31 ft by 3ft counter space of 4 x 4 in tiles. Went very well and I am extremely pleased with my new looking tiles on my kitchen counters.